Need a gift idea for your favorite rock star? 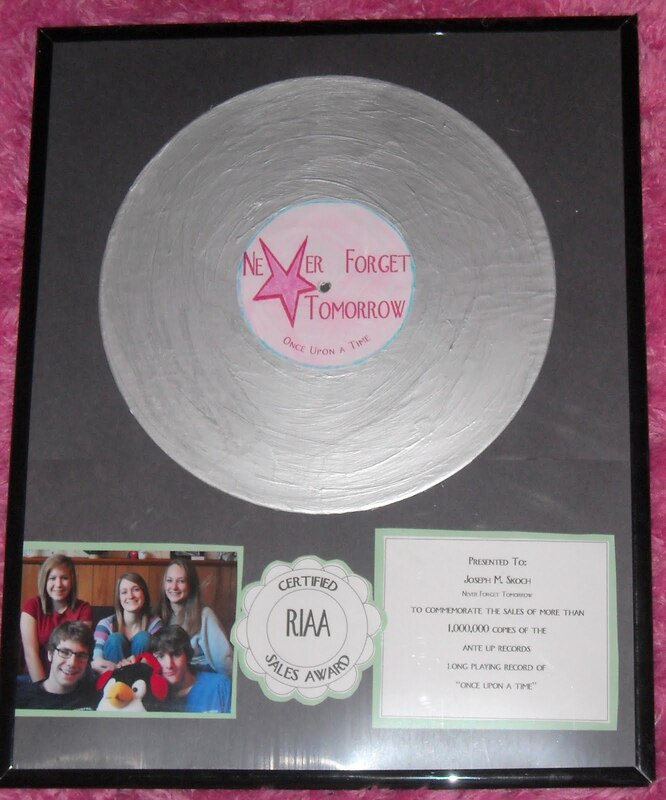 For her brother’s birthday last January, Annie created this “Platinum Album”. She took an old record and painted it silver. She created a label and sales record and posted those, along with the band’s photo, inside an old frame. Her brother loved it and it hangs in the hall outside his room. Speaking of the rock star, he is away at college studying jazz piano. He misses his rock band, though. Four of the band members started college this year (3 studying music!). The young lady with the amazing voice just started high school! On a high note, they released their first album and it has been selling on I-tunes! My son, who wrote the music and arrangements, worked on the project all summer. The teens love it! I love hearing the lyrics and learning about the inspiration behind the songs. So cool! I listened to some of the song excerpts on itunes – they sounds great. And the girl with THE voice sounds incredible! Okay, that’s a fantastic idea with the album cover. And cheers for the rock star! That is a really cute album idea!! That is a very sweet idea! And what a nice sister. That’s a neat gift idea. I tried to listen to your son’s music, but I don’t have iTunes downloaded. I’ll have to look in to it more tomorrow– I would like to hear it. This is a great idea!!! My “rocker” son would love it!